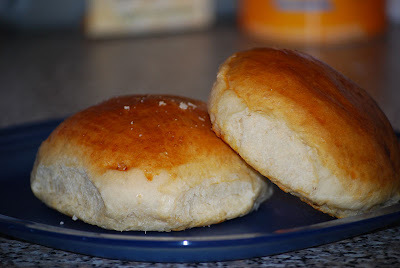 I made hamburger buns yesterday - they came out really beautiful (how sad is it that I am so excited about how wonderful looking my hamburger buns came out!). My only pictures today are of the only two remaining buns! It was nice to have some American fare - sloppy joes (another new recipe) and an old favorite, mushroom burgers. 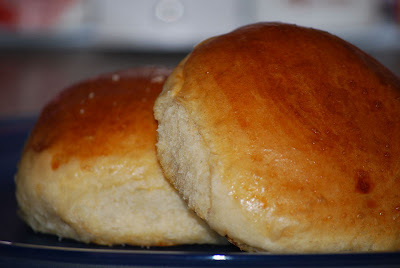 Dustin still misses American bread and buns, but I will keep trying :-) I put some of the wheat type flour in the buns, so I'm sure that could have affected the flavor, but I thought they were pretty good. The consistency was good, not quite as moist as some of the buns in the US, but nice none the less. I had hoped to make my sister-in-law's recipe for sloppy joes, but I didn't find any canned condensed soups last weekend. Brenna took no nap today and threw a fit at the end of German class, not quite sure what her mood was for today...Hopefully, tomorrow will be better. At least it is Friday tomorrow :-) We still enjoyed reading several more books this afternoon with the extra time. Get well wishes go out to my Grandma today - our prayers are with you as you recover! Well, that is all for today - take care! Amanda!!! Cute buns!! I started a blog a while back and don't keep it up- but I'm staying at home with Kingston now- so I'll try to be more on top of it! Brenna is getting so big! I'm sad we missed you guys over the holidays- but we were so busy!! Kingston is getting so big... 7 months today! Hope you are all well! !